What Is HelloTalk? – An App to Find Language Partners in 2 Minutes! Price: Free. Paid Versions Available. So you want to learn a language but you don’t have anyone to practice with? Or finding a language partner seems challenging? Then HelloTalk is right for you! When I used HelloTalk for the first time I was really surprised how fast it is to find language partners. You just need to write your information (= what is your name? When are you born? and so on.). Then set what language would you like to learn and what is the language that you already speak. Then you’ll immediately see the people that are trying to learn the language that you already speak and they are the native speakers that you would like to learn. Let’s say for example that you are an English speaker and you want to speak Spanish. Then you will immediately find tens or hundreds (or even thousands, I don’t know the exact amounts) of Spanish native speakers who are learning English. They will help you to learn Spanish and you can help them to learn English. It’s a win-win situation. And in the top of that, you will get a new friend. 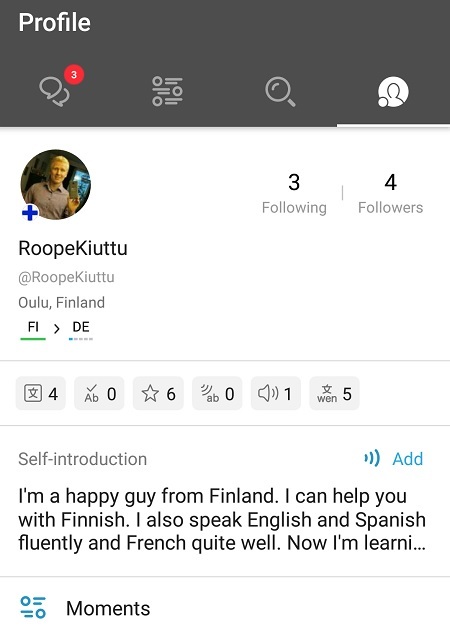 I set up on HelloTalk that I am Finnish and want to study German. Then I saw “Matches” which means that these people are German native speakers and they want to learn Finnish. I was surprised how many Finnish learners I always find even though it’s just a small language. Imagine how many Spanish => English or English => Spanish learners you could find. 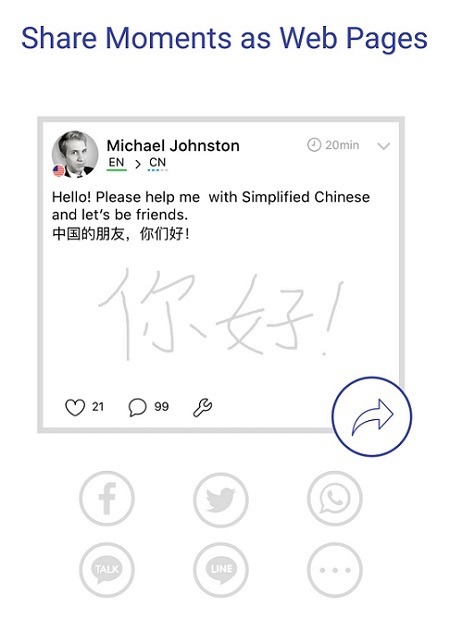 HelloTalk doesn’t only connect you with other language learners but it also gives you tools that can help you to study a language together via your smartphone. There are so many useful tools on HelloTalk that I haven’t even tried them all yet. I gathered here pictures of some tools that you can use. The fastest way to learn a new language is probably by speaking it a lot. 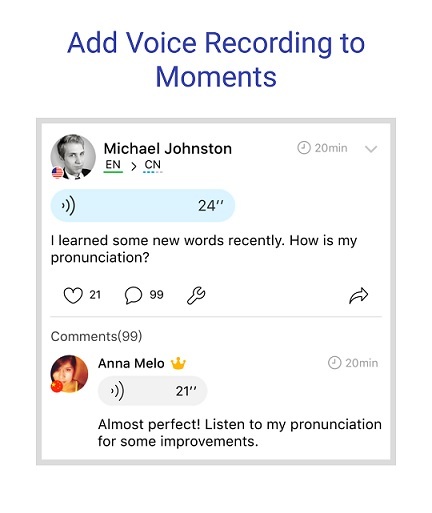 HelloTalk doesn’t only concentrate on typing because you can also send voice messages and practice your pronunciation. Then your language partner can give a right pronunciation for you. One good thing is that you can listen to the right pronunciation over and over again if you want. In addition, things that you learn are most likely relevant to your everyday life (compare boring classroom studying). You can share moments in HelloTalk. Write also in Chinese and with other letters. 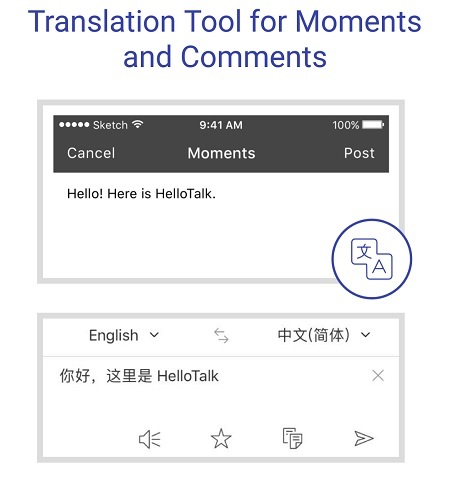 HelloTalk enables you to share moments on other social medias. It also gives you a possibility to write in Chinese letters. I know from my own experience that Chinese letters require practice even though it is an easy language to learn. A translation tool is a wonderful tool that is not available in normal social media apps like WhatsApp. You can set up to which language you want to translate your partner’s messages and HelloTalk gives you a correct translation. This tool can save your time because you don’t need to jump from one app to another in order to understand what the other one wants to say. You can also make group chats in HelloTalk. Then you can gather many members to chat with a same group and practice together. Voice calls are also possible which makes language learning more effective. Who Is the HelloTalk for? HelloTalk is for anyone who wants to practice a foreign language with someone else. You can also find new friends and meet interesting people through this app. You will also have an opportunity to share your own native language to a foreigner which can be fun. It’s completely free to join in HelloTalk and chat with your language partners. I have always used only their free version. They have also a VIP-version available if you want to invest some pocket money to this app and to your language learning. I bought once one language app for learning German just because I thought like this, “If I buy this app, I have invested money on my German studies. It motivates me to use this app in order to take a full benefit of my invested money.” Maybe buying a HelloTalk VIP-version can also motivate you to study more your target language. Exclusive Stickers And Cards (You can send special stickers, emojis and greetings cards to your chatting partners) -> Pretty useless feature, in my opinion. Chatting too much on a phone can be bad for your overall health. Conclusion – Is HelloTalk Good? My experience with HelloTalk was very positive. It helped me to find some German speakers much quicker than I had thought. However, I haven’t used it very much lately because I don’t like to chat on my phone anymore. I prefer talking to people on phone or in a real life because it’s more effective. Typing on your phone can make tension in your neck and back so it’s not very healthy either. My #1 recommendation for finding a language partner is still Italki because I like their platform a lot. I guess that Italki is also much bigger than HelloTalk. I don’t have a statistic about this. Let me know in the comments if you have. Have you used HelloTalk, Italki or other similar services? I would love to hear if you have used this kind of language apps to practice languages. Seeing a new comment from my visitors makes my day. Please, use 10 seconds and leave a comment below and I will be sure to answer you personally within 24 hours (usually in 2-3 hours). This look like an incredible app. I have been learning german and it is really difficult to find someone who is learning the same language as you are but this app seems perfect to practice particular language skills. 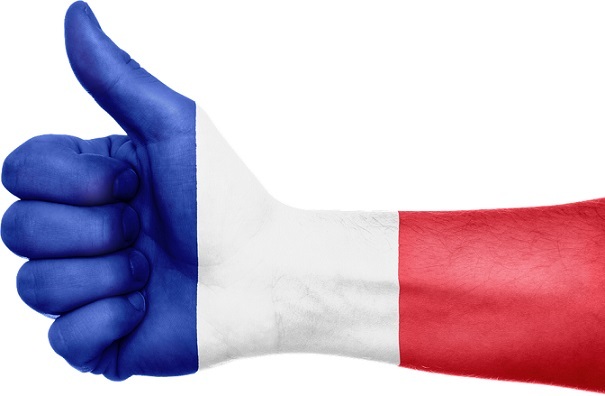 It is pretty impressive how soon you can find partners who are learning the same language. I’m definitely going to try this one. yeah, HelloTalk is a great app. By the way, where are you from? I am also studying German sometimes because I am living in Austria at the moment. And I may want to work in Switzerland in the future and there German is one of the native languages. Have a look at Italki also if you want to find language partners to practice German. I used Italki to find language partners for Spanish and French. It’s my favorite language learning community and totally free. You can also have professional lessons and informal tutoring from native speakers if you want to buy it. You will get $10 bonus if you register through my links. This is a great idea. 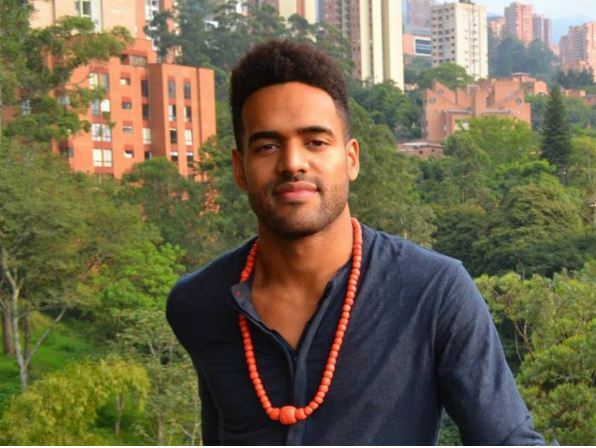 I have been struggling to learn Spanish for a quite while and one of the biggest hurdles to my progress has been finding suitable people with which to practice. Spending time in Spain, speaking to the locals helps but finding Spanish-speaking people when back in the UK has proven more difficult than I would have imagined. This app could be the perfect solution to that problem. yeah, you can for sure become fluent in Spanish also in UK. 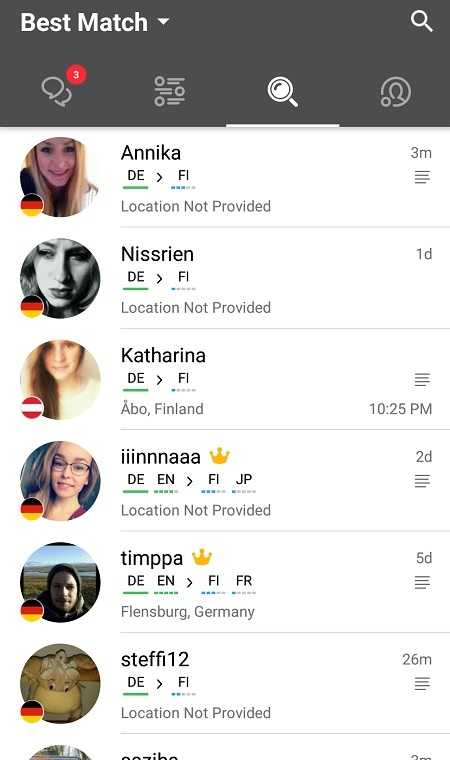 In HelloTalk and Italki you can find a huge number of Spanish native speakers. I know that there are also big communities of Spanish-speaking people in UK. Maybe you could practice Spanish also with them? What do you think? 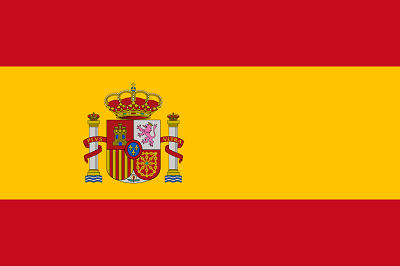 Have a look at also these Spanish learning opportunities. Oh my goodness, this is great. I always wanted to learn Hebrew. This just may be my tool. As a senior I don’t want to put out money before I try, so this is right up my ally…lol. I will try it. I noticed your pricing was in EUROS. Does the site offer in other money values, like Canadian? as I mentioned in the article, Hellotalk is totally free to use. I have never paid a penny of using it but there are also premium versions available. This is one amazing product, I had no idea existed. I always wanted to learn Hebrew, so this is my chance to try and see if my tongue will work for this language. Does the site offer prices in other countries? Does the app work on an I-pad? I was always intimidated with learning a new language, thinking it would take too long to learn. Getting the proper pronunciation is also important. Is this also available? Hebrew is a very interesting language and I am 100% sure that you will learn it when you practice. This app is totally free to use as I mentioned in the review. Then they have some VIP-versions if you want a premium service. It works with iPad as well. You will for sure learn the right pronunciatoin when practicing with native speakers. You will catch the right phrases, words and so on. 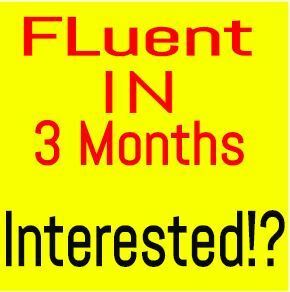 If you want to learn a new language (Hebrew) fast, have a look at Benny Lewis’ Fluent in 3 Months program. I wish all the best for your Hebrew studies! Yes, HelloTalk is also available for iOS. You’ll find many German native speakers. It will help you for sure to learn German more easily. Did you also check Italki? It’s my favorite language learning community. That’s great! Like I said I just want to practice my vocabulary and well if in the meantime I get to meet awesome people I’m up for it! I’ll download it and let the blog know about my experiences there. Also yes, I was just about to! I’ll check your other article about Italki and download the app whenever I have the time, thanks Roope! Now this is one brilliant step towards gaining proper understanding and good knowledge of what you are doing. Like the saying, practice makes better, Hello Talk is a great channel towards practicing and perfecting what is being learned. Not too long ago, i started learning the German language, a friend of mine occasionally mocks me, saying I possibly couldnt get it right since literally no one around me speaks German. How do you practice he asked? I think I now have an answer for him. yeah, HelloTalk and Italki are probably answers to your friend’s question ;). You can practice your target language with a native speaker no matter where you live in the world. Actually, I was learning German much faster while I was living in Finland than I have learned in Austria even though it’s a native language here. The world has become smaller and the Internet has opened us many amazing opportunities. I believe my written English is above average for I have written more than 1000 articles for English language dailies in my home country (If I was bad, they would have never published my articles). However, my spoken English is below average. I speak stilted English. Over the years, I have developed my English writing skills, however, I have failed to improve my spoken language. I did not know about this language learning app. Now that I knew about HelloTalk, I believe I can find people who are willing to improve my English by communicating with me. Yes, Hellotalk is a fast way to connect with English native speakers and also other English students. I think after using Hellotalk for a while your spoken English will be as fluent as written English. I have downloaded this app, however, I am yet to use this app (I have created my profile though). I hope to use a free version for a while, and when I really liked the free version, I may try the paid version. When I am trying the paid version, I may opt for monthly subscription. If I liked this app I may buy life long membership. Thank you very much for introducing me to this wonderful language learning app. I see. I have always used only the free version of HelloTalk but I believe that the paid version would be great as well! I am trying to use Hellotalk. Because I am not good in writing English. I am good top speak English but not written English. I just want to find in this app a lot of people that is good in English. I am Asian, I am not completely mastered English so I want this to become better. I will try. you will find a huge number of English speakers on HelloTalk. There are always lots of people who want to practice English with you. Another great resource is Italki. Actually, I have used Italki more than HelloTalk but both of them are great. This is an incredible app I must say. I’ve come across a few other apps that seem to be selling this same idea on other post you’ve made. I think this is a very genius ways of getting someone to learn a new language at ease. I think Hellotalk will go a long way for me and others like me. It can help to solve so many difficult problems encountered during the normal conventional means of learning a language. With this app, every learning can be done at ease when needed to with a bit of more flexibility. Yeah, HelloTalk is a wonderful app. Thank you for sharing your thoughts as well. Love this app! Lived in South Korea for 4 months last year with no previous language training and met some amazing life long friends through this app which also helped me get used to the different language! Thanks for this awesome review! Thanks for sharing your experiences also! I’m glad you’ve enjoyed HelloTalk as well!